As you probably know, California High Speed Rail won a major victory last Friday when state lawmakers approved the first round of spending. Construction in California’s Central Valley could start as soon as early next year. Even if the initial construction segment is put under construction as planned — that may be difficult considering the regulatory approvals and barrage of lawsuits standing in its way — there are enormous obstacles to actually implementing the planned connection between San Francisco and Los Angeles, the most significant example of which is the lack of adequate fiscal resources. 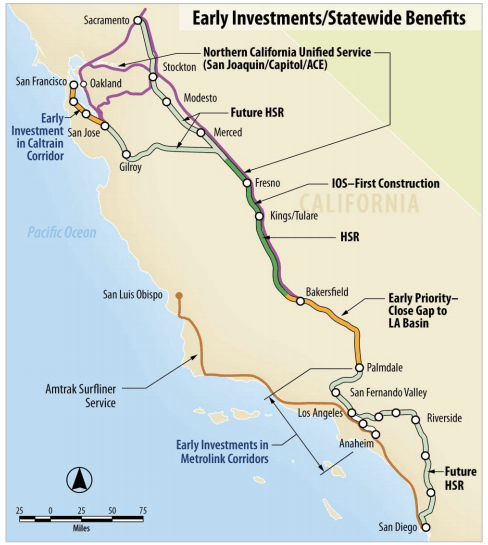 The California High-Speed Rail Authority’s 2012 business plan expects that it will cost $31 billion to connect Bakersfield to the San Fernando Valley, meaning that about $18 billion in funding is still necessary even for this first step, taking into account the roughly $8 billion released last week and the additional $5 billion for fast trains included in the 2008 referendum. For a one-seat ride between San Francisco and L.A., $51 billion will be necessary; for 2h40 service between the cities, $68 billion is required (this is in year-of-expenditure dollars; this is equivalent to $53 billion in today’s money). While that figure might be acceptable from the perspective of overall public investment in infrastructure, where will that money be found? The U.S. transportation reauthorization bill passed last week provides no additional funding for high-speed rail. Republicans have demonstrated against intercity rail and rejected several projects despite federal support. In his campaign platform, Mitt Romney cites “privatizing Amtrak” as a top way to save the government money. The outcome of the 2012 elections will determine whether California will be able to move ahead as expected, or whether it will have to put off plans by two years or more. The reality is that the prospects for the project’s completion in the next decade and a half, as currently planned, are limited. There is simply inadequate determination in the U.S. political sphere to make a project of this magnitude anywhere close to easy to execute. That does not mean that the project will not be built, but that making it happen will require years of negotiations, compromise, and expansion of popular support. We could be at the start of something very exciting, but there is a lot of work still left to be done. As Streetsblog San Francisco reported, one potential source of funding the project is the state’s new cap-and-trade program. State officials are considering earmarking some of those funds for walking, biking and transit. Elsewhere on the Network: Bike San Diego reports Caltrans has issued an order to remove ghost bikes on a bike path near a highway where a cyclist was killed. Seattle Transit Blog estimates that the land consumed by the city’s front yard zoning regulations could have been used to build 80,000 homes. And Cap’n Transit questions New Jersey Transit’s parking plans along a new route of the Erie Railroad.